Workers across Ontario worked hard to win a minimum wage increase, paid sick days, emergency leave for all, more vacation time, equal pay for equal work and fairer scheduling. Starting today these new rights will be phased in over the next year. 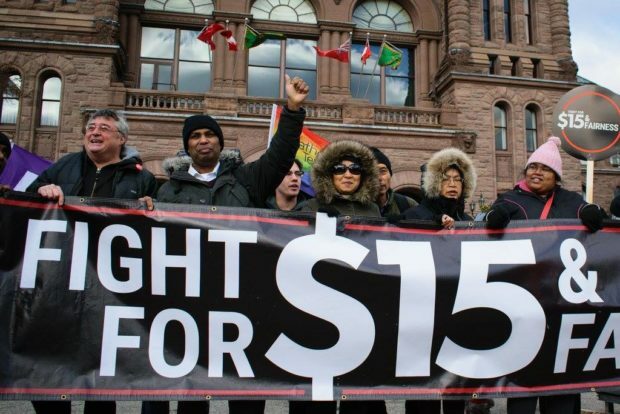 Finally, after years of struggle, 1.7 million workers in Ontario are beginning to benefit from a raised minimum wage and stronger labour laws. Starting today, the general minimum wage is $14 dollars per hour. The minimum for students has gone up to $13.15 an hour, and liquor servers will earn at least $12.20 an hour. This is a direct result of the organizing by Workers’ Action Centre members and our allies! Thank you for being a part of the fight for decent work. We still haven’t won all the demands of the Fight for $15 & Fairness campaign, so it is important that we continue to organize in our communities. Still, many changes to Ontario’s labour laws come into force today, and we want workers to know our new rights at work. 10 days of personal emergency leave for all workers, 2 of those days will be paid, and a doctor’s note is not required. 3 weeks paid vacation after 5 years of working at the same company. Domestic or sexual violence leave of up to 10 individual days and up to 15 weeks if the worker or the worker’s child must deal with domestic or sexual violence. The first 5 days of leave each year will be paid. Temporary help agencies will have to give workers one week’s written notice or pay in lieu of notice if a longer term assignment ends early. Forming a union will be easier for homecare workers, temporary agency workers, and building service workers. An employer must recognize a union if the majority of employees signs union cards. Other improvements makes it easier to form a union in other sectors. Misclassification of employees as “independent contractors” is against the law. Employers will be responsible for proving that an individual is not an employee. Equal pay for equal work for casual, part-time, contract, and temporary workers doing work similar to full-time workers. Workers will have the job protected right to refuse shifts if the employer gives less than 4 days’ (96 hours’) notice. Workers will have the job protected right to ask for a schedule or location change after working at a company for 3 months. 3 hours of pay for shift cancellation with less than 2 days’ (48 hours’) notice. 3 hours of pay for on-call workers that are not called in or work less than 3 hours. The Ontario government has promised to hire up to 175 employment standards officers to improve the enforcement of workers’ rights. Please contact the Workers’ Action Centre at (416) 531-0778 if you find that your new rights at work are being violated. Our lines are open Mondays to Thursdays from 11 am to 3 pm for support or to make an appointment. Together we have won so much, and together we can win all that workers need. Keep standing up for decent work by sharing this information about new workers’ rights, so that workers in your community can begin to defend those rights. Also, let everyone know how urgently all workers need a $15 minimum wage, our improved labour laws, and more!